It can take money, sometimes even years to build a good credit score. But you can ruin a good credit score in the blink of an eye. All it takes is a few credit card swipes and a few missed payments and your credit score is trashed for the next few years. Here are eight ways to ruin your credit that you obviously want to avoid. Open up a credit card before you’re ready. While you can technically get a credit card at age 18—younger if you have a co-signer—being of age doesn’t mean you’re officially ready for a credit card. Before you apply for your first credit card, you should have some financial basics in place. Can you handle a checking account without overdrafting? Can you make deadlines without being told? How well do you manage money? Without some basic financial skills in place, you're at risk of ruining your credit before you really get to use it. Open a credit card without a stable job. Credit card issuers are required to ask for your monthly income before approving you for a credit card. However, they don’t always ask for proof of income or the amount of time you’ve been employed. Before you get a credit card, make sure you have consistent income to make your monthly payments. Without steady monthly income, you may not be able to make your monthly credit card payments, which could cause you to miss your payments and hurt your credit score. Open too many credit cards at once. Young adults just starting out with credit often make this mistake. It can also happen with adults who've had credit for years. Opening up several credit cards in a short period of time is often a symptom of a bigger spending issue, one that can lead to unaffordable balances and late payments. Skip your credit card payments. It doesn’t matter whether you forget to pay, can’t afford to pay, or purposely miss your monthly credit card payments, your credit score will be affected either way. After 30 days, your late credit card payment is reported to the credit bureaus, and after six months your account is considered in default. Since payment history is the biggest factor influencing your credit score, missed payments can cause serious damage. Ignore past-due bills, including medical bills. If you move and don’t pay your last cable or electric bill, the companies will come after you for payment. They’ll call you and send letters for a few months to attempt to get you caught up. If that fails, they'll get debt collectors involved. Once a debt collector takes over the account, they’ll add the delinquency to your credit report, which will ruin your credit and your ability to have applications approved in the future. Let someone irresponsible use your credit card. Unless someone steals your credit card, you’re responsible for any purchases made on your card. So, if you let your little sister borrow your card for pizza and she maxes it out on clothes and shoes, you’re on the hook for the balance, whether you can afford it or not. This goes for adding authorized users to your account as well. If they're going to have a physical credit card, make sure they're responsible borrowers. Co-signing a credit card or loan often seems like the right thing to do at the time. You want to help out your loved one, but you're putting a lot on the line for that person. Too often, the person you co-signed for goes rouge, doesn't make the payments, and leaves your credit in shambles. Remember that co-signing means you're accepting responsibility if the other person doesn't pay. You must be ready to step in and assume payments if you want to protect your credit. Not protecting your sensitive personal information. Many people become victims of identity theft because someone they knew and trusted opened accounts in their name. Keep your personal information safe to prevent anyone from gaining access to your accounts or opening new accounts in your name. This includes your bank account, credit card numbers, and especially your social security number. Once you've ruined your credit score, getting a better one takes a lot of time and on-time payments. 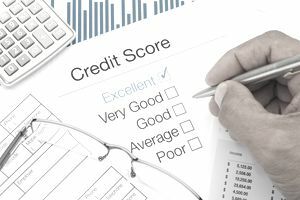 The mistakes you made will follow you for at least seven years, but fortunately they won't look as bad if you turn your bad habits around and start being responsible with your credit.